I guess like a lot of people I have been aware of the national discussion about helping our pollinators. Have I got enough of the ‘right’ sort of flowers in the garden? Should I plant an area of wild flowers? The questions seemed to be endless and with each question came another. What sort of wild flowers will grow where I live? I decided to try and make sense of it, keep it simple and do something. So, when my overwintered purple broccoli went to flower, I decided that I would leave it. I was really amazed at the numbers and varieties of bees that started to visit. There were different varieties of bumble bees and honey bees. What else could I do? Well, I decided to find out more about bees. Makes sense right? Help the bees by finding out what they like. Maybe even plant a bee restaurant. 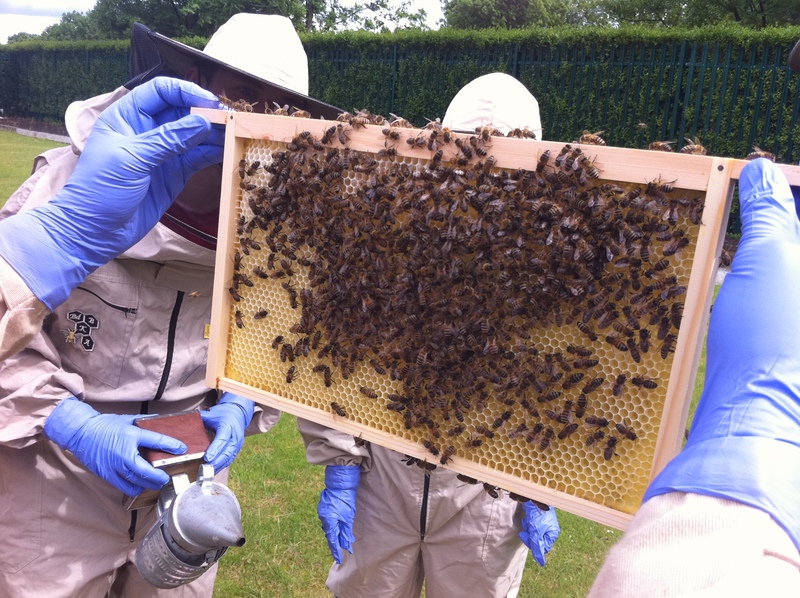 Not sure exactly how it happened but after a couple of emails I ended up joining a bee keeping course. This weekend I was in Bradford on a beginners course and it was even more fascinating than I had previously thought. Tens of thousands of bees living in a moderately sized box, pollinating our crops, increasing our yields of fruit and vegetables and at the end of the growing season a crop of honey. I was hooked! What really amazed me is that bee keeping does not have to be done on huge rolling estates by the landed gentry; it is something that can easily be done and is done in the back gardens of urban Britain. There are hives all over the place and even on top of a certain building society office in the centre of Leeds! Bees really do take care of themselves with a bit of management and help from the beekeeper. They go out and get their own food, they clean up after themselves. The bee keeper needs to make sure they have enough room and are healthy. So my advice to anyone thinking about bees is go an a course. At the very least you will have a great time and if they are anything like the people at Bradford Bee keepers Association, you will find a passionate and very helpful bunch! Wish they’d kept their original name though – Love the fact they were all Idle Beekeepers! !